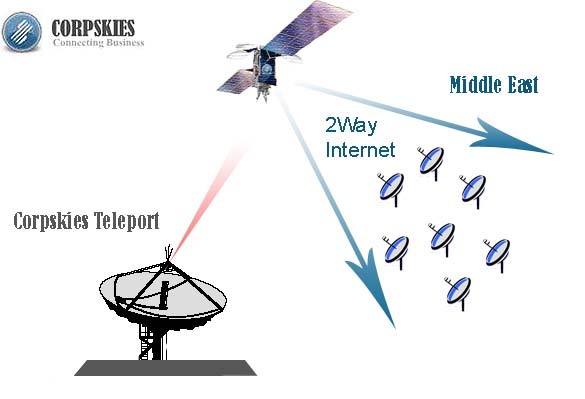 Diagram showing satellite internet access. In this configuration many customer VSAT sites, often independent of one another are provided with access to the world internet backbone system, enabling access to web sites, email and other services worldwide. There is a large satellite dish at a Teleport where the interconnection to the terrestrial internet backbone occurs. At the teleport is router equipment and processing equipment to manage all the remote VSAT terminals. The network typically has a high bit rate (2 to 40 Mbit/s) outlink carrier from a large teleport hub dish, used to distribute download data to all sites. The total bit rate is shared amongst all sites. The uplinks, or return link transmissions, from each remote VSAT go to the hub teleport. These messages are mainly mouse click and sent emails. The customer terminals are typically called "satellite internet" dishes. Remote sites at small, 89cm - 1.2m diameter. The larger sizes are need at the edge of the coverage beam areas. The teleport hub is typically a large 10m diameter dish. Business with a headquarters and remote offices may use VSAT technology to provide both star and / or mesh networking between their own private sites. Voice telephone calls using VoIP and remote access from the offices to a central computer at the headquarters are typical applications. Both the hub and the remote office sites are typically called "Private VSAT terminals". All VSATs are of similar size, perhaps 1.8 to 2.4m diameter. 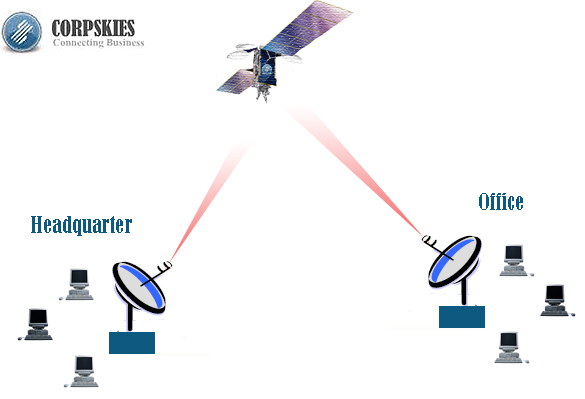 Because the total number of dishes is small it makes sense to consider buying even larger dishes (3.7 to 4.5m) so that advanced modulation methods may be used in order to significantly reduce monthly charges by using the satellite more efficiently.